When I was picking blackcurrants a few days ago I noticed that I had a little passenger in the punnet. As you can see as it sits on a blackcurrant, this is a tiny creature measuring between about 4mm and 7mm (0.15" - 0.3"). It's nothing to be scared of. Google tells me that my little captive is a green orb weaver spider or Araniella cucurbitina sometimes also called the green cucumber spider. We all know that spiders have eight legs but did you know that most spiders also have eight eyes? You would think that this would mean that they had good eyesight but in the case of web spinning spiders, like our little friend here, their eyesight is poor. It's eyes can probably only detect changes in light and it will rely on taste, smell, touch and vibration rather than sight. I guess its hairy legs have a part to play here. 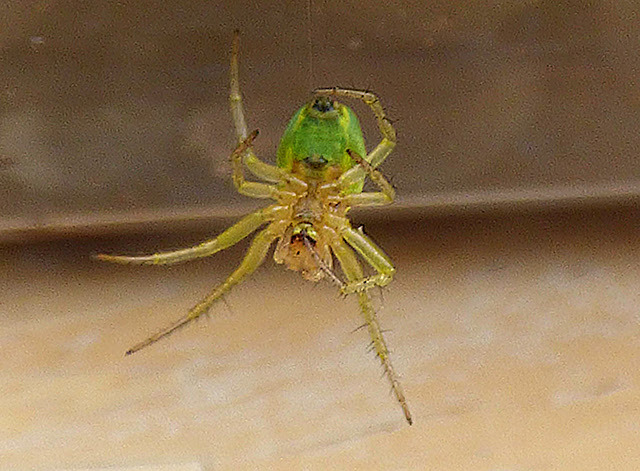 The green orb weaver spider spins a small web between two leaves and then hangs underneath waiting for its small prey to become entrapped. It doesn't hide away, like many spiders, and you would expect its almost fluorescent colour to give it away, however hanging upside down its green underside is well camouflaged amongst the leaves. Just in case you are wondering the little spider was popped back on a blackcurrant bush to enjoy the rest of its day. 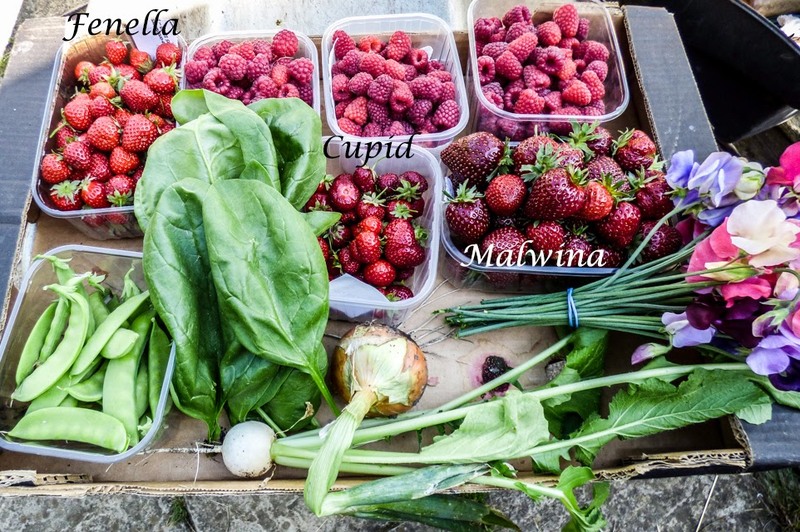 We had a couple of days away last week so our first harvest of the week was on Wednesday. As it was very hot we spent all the time picking and watering. We are still picking strawberries. Cupid and Fenella are still providing a few berries but are coming to an end although Cupid is bearing one or two new flowers. The later Malwina still has fruits to ripen. The Tulameen raspberries which were unaffected by the mystery death of half of our Glen Ample canes are now producing lots of fruit and we are managing to share the tayberry with the blackbirds. We have picked the first young leaves of spinach and the first baby turnip. We are lifting autumn onions as we need them but the summer onions and shallots look as though they will soon be dying back. More berries were picked on Friday. It doesn't seem to have been a good year for blackcurrants and gooseberries. There are nothing like as many blackcurrants and the fruits of both are much smaller than usual. Luckily the jostaberries are helping to full the gap that they have left. Whilst picking the jostaberries the strong strawberry aroma attracted my attention to a few old, straggly alpine strawberry plants which were determinedly producing a few fruits. These were duly picked. New alpine strawberry plants were planted this year which will hopefully take over production next year. I picked a few whitecurrants but these too were very small and hardly worth the effort of picking. To be honest this isn't unusual as they never seem to produce good fruit - maybe a hard prune is called for. 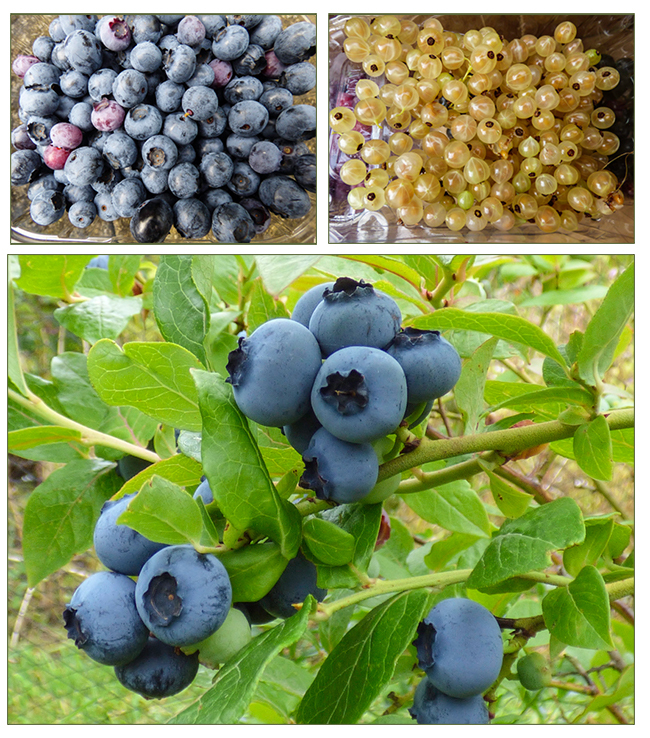 On the other hand the blueberries are providing the best harvest that we have had from them. Having decided to cover them this year we have been able to leave them on the plant unmolested to develop fully. The sweet peas are coming on stream now and so far I am pleased with the colours that I chose. The posy on the right also includes one or two cornflowers as the annual flower bed is now starting to produce cutting material, as well as a nectar bay for the pollinators. I seem to have ended up with brighter colours this year. Maybe the pastels are just slower to flower. Dead heading has been added to my regular allotment tasks. We dug the first root of another trial early potato - Vivaldi - which like its predecessors passed the taste test with flying colours. The peas are now starting to fill out and be ready to harvest. We picked just enough for dinner. The Witkiem Manita broad beans have almost finished but the more diminutive Robin Hood beans - on the right of the photo below -have stepped in to fill the breach. After what we thought was a very 'iffy' start the climbing beans are now going strong and we had a few Cobra - climbing French beans - to kick off the production line. Let's take advantage of the cooler conditions to explore inside the garden greenhouse. When you enter our garden greenhouse at the moment you could be forgiven for imagining that you have been transported into a jungle. The plants have thrived in the recent heat despite us being away for the two hottest days of the year. 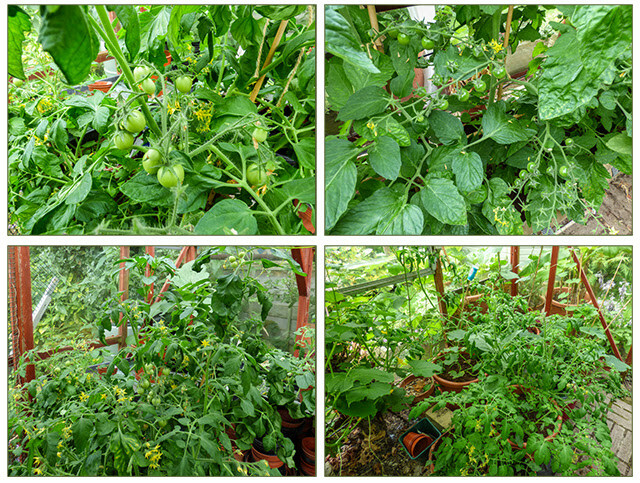 The tomatoes are setting fruit. The mini cucumbers are providing a constant supply of fresh fruits. The plants are exploring freely. 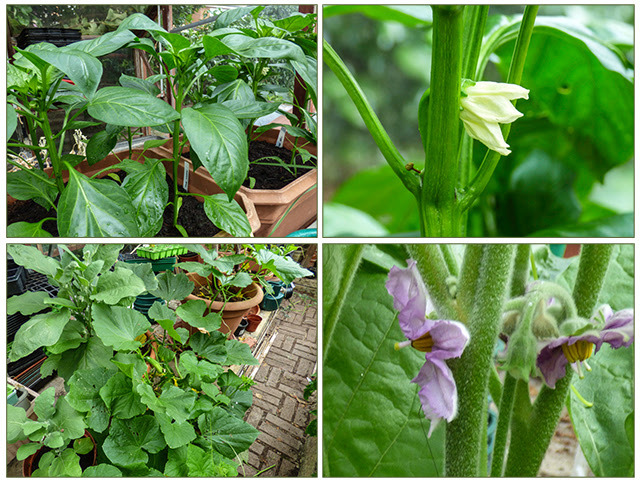 The peppers and aubergines haven't set fruit yet but they are flowering. I wasn't as successful at pollinating the peach and nectarine as I was the apricot. We have just one peach and two nectarines but will they ripen? There are immature bunches of grapes dripping from above. The are some ornamentals too. This year I fancied growing some coleus from seed - something that I haven't done for a while. Climbing up the canes below are a thunbergia also grown from seed and self sown ipomoea or morning glory - will they flower?